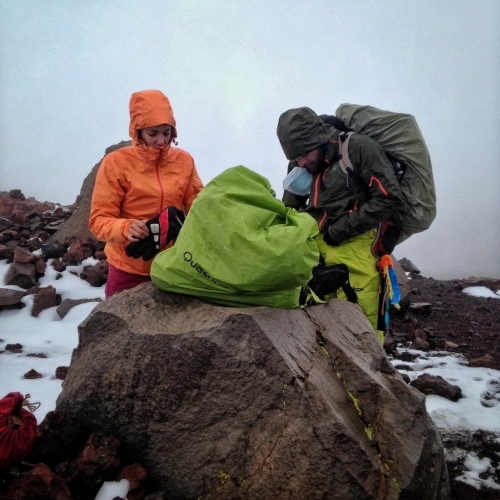 10 minutes is not ample time to properly prepare yourself for a 6000m mountain climb. I learnt this the hard way after my attempt to climb Chachani, a 6057m mountain 3 hours outside of Arequipa. I’d just done the Colca Canyon trek the day before and was looking forward to a day off to rest my legs before attempting to climb Chachani. Venturing downstairs in the hostel I was staying at, I inquired as to when the next trip to Chachani was going to be. After making a few phone calls she responded that I could go on the one leaving today but I’d have to be ready to leave in the next 10 minutes. In hindsight, that was not the best decision I’ve made to go ahead with it, but since the next one wouldn’t be leaving for another 3 days I didn’t want to waste anymore time sitting around. This French couple were a lot more prepared than me! I explained to her that I didn’t have any appropriate hiking equipment to climb such a peak, scrambling for any kind of excuse to get out of the Chachani venture. She squished my attempt at backing out by reassuring me that all the necessary items could all be rented for an additional fee. Like a magician pulling a rabbit from a hat, a 5 liter vessel of water materialized from behind the desk which she added onto my bill. She pointed out that each hiker had to contribute their own water for cooking as she passed over the water with a piece of paper listing the other required items I’d need. Grabbing the items from the desk I quickly ran up to my room with the limited time I had to pack up all my belongings. After packing my day pack with a few of the required items that I’d had on hand, I heard a horn toot outside and knew my ride had arrived, I was off to join the others to conquer Chachani! The guy sitting behind the tour company desk taking us to Chachani took one look at my day pack and asked where my backpack was. When I answered that the one I was holding was it, he smiled and said that it wasn’t going to be large enough. According to my list of required items, a 60L pack was required and my 20L one wasn’t going to accommodate the water, sleeping bag, sleeping mat and eating utensils I needed to conquer Chachani. For some reason I’d envisioned us having donkeys to carry our equipment like I’d previously experienced on other hikes but this was not the case. Basically I didn’t have any of the required items so I hired a larger bag, some hiking boots, waterproof jacket, pants and hiking poles. There were only two other people that I would be joining on the trek, a French couple who seemed a lot more prepared than what I was. We packed all our equipment into a 4WD and commenced our journey to Chachani. Before the snow started falling. I’d told the tour company that I hadn’t brought any snacks or proper socks. They assured me that they would stop by a market on the way to Chachani to buy some. Well, we didn’t stop at any markets, they dropped us off at a small corner store which stocked a very limited range of items. Looks like I would be stuck wearing my anklet socks, not really the most appropriate lining for hiking boots but they were the cards I was dealt. Rummaging through the sole aisle of the store, the only food stuffs that I recognized were a jumbo packet of Oreo cookies and some muffins. Not really the most healthiest of snacks but I begrudgingly purchased them anyway. Emerging from the store, the guide and the driver had their heads buried under the hood of the engine. Either they were trying to impress some women with their manly mechanic skills or we were having car issues. The guide slammed the hood shut and exclaimed that it would not be possible to make it to the mountain until the car was repaired. Our foot clipped the first hurdle but we quickly recovered after finding a small Auto Mechanics on the outskirts of town. There was a small Peruvian man, well that goes without saying as everyone is small in Peru, tinkering under the hood of a taxi. Our driver approached him and pointed to vehicle mumbling something in Spanish. I watched the temperature gauge on the dashboard of the car drop by a degree every quarter of an hour as the mechanic went back and forth between the car and his workshop. The Chachani base camp was a 2 hour hike from where the driver had dropped us off. There were a couple of other hikers waiting where we were dropped off to be taken back to Arequipa. They told us it had been snowing all night and that they hadn’t made it to the summit due to the extreme weather conditions. That made me even more determined to make it to the top and with that little morsel of motivation the guide signaled to us to follow him. 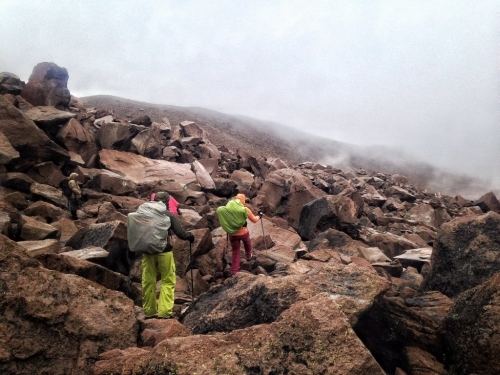 Hiking to base camp, you make your own path! Chachani base camp wasn’t really what I had imagined. It’s was like when you envisage what a radio announcer’s face would look like. You build an imaginary mug shot of them in your head but when you do eventually see what they look like, my artist’s impression of them is usually grossly inaccurate. What I had anticipated was a large tent or some sort of log cabin, with a nice fire place that we could all gather around to share a nice home cooked dinner. Instead, what I was confronted with were three small tents at the base of Chachani mountain. 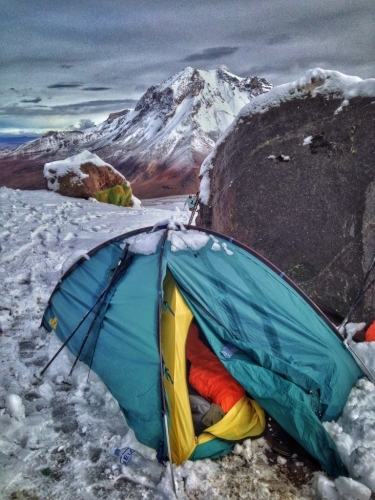 The guide pointed to one of three man tents, “Is this good for you to share?” he questioned. I’m not sure why he even asked because there didn’t seem to be any other alternatives in the near vicinity. It looked like I would be taking my relationship with the French couple to the next level, sharing sleeping quarters on the first night! Dinner wouldn’t be ready for a few hours so we had some time to explore the area. It had started to snow on Chachani, I had found a large rock with an outcrop on the side of the mountain which provided shelter from the snowfall. Nestled into a crevice, I lay on the gravel surface and breathed in the surrounding scenery, watching the hypnotic dripping of the melted snow as the tiny droplets were fed until bloating to the point they lost their grip on the rock above. I imagined this one little drop joining other drops to create streams, then rivers, then pouring out of a tap into a glass and into me. When you think about it, that glass of water you might be drinking right now, has probably been in and out of millions of beings before you placed it into your mouth. You’ll never look at water the same again! 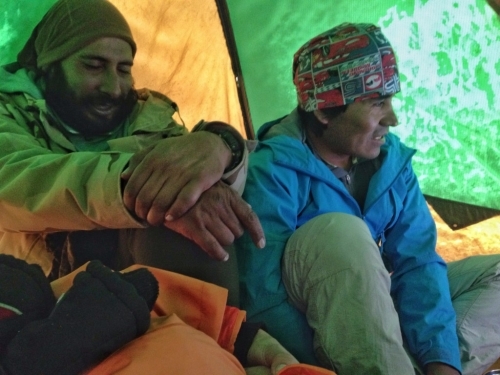 Our guides Gusto and Marco inside the multi purpose kitchen/sleeping tent. “Dinner’s ready”, Gusto’s voice awoke me from my catatonic, watery daydream. Picking myself up I ventured back to camp, grabbing my eating utensils from my snow covered backpack. It was quite a process to slide into the kitchen tent, trying to remove my boots whilst not contaminating the tent with snow. Putting clothes on and off inside a tent is such an arduous process. If there’s ever a poll about what event should be added to the Winter Olympics, I’m going to nominate this event! Half of the 5 liters of water that I had carried to Chachani was sacrificed in cooking our pasta and soup courses. I’m pretty sure the soup was just two minute noodles and I would have been far happier just to have eaten them raw rather than carrying the extra weight to cook them. Where’s the nearest 7-Eleven? I’ve run out of toilet paper! Marco filled up our bowls with the first course. Sitting on a slant backwards, I was battling to keep my soup in the bowl as well as refraining from not touching the sides of the tent which were wet from condensation. It was like a game of Operation, the object of the game being not to touch the sides and I was performing surgery on my bowl of soup. 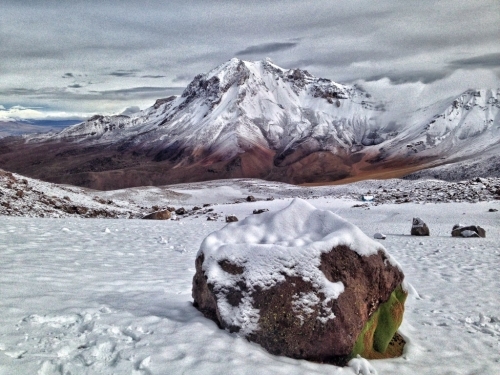 Whilst slurping on his noodles, Marco went over the game plan for hiking up Chachani. We were to commence at 1am and he’d estimated it was going to take about 6 hours to reach the summit. He instructed us that we were to take our snacks and a couple of liters of water but leave our remaining items in the tent in order to reduce the amount of weight we needed to carry up. It was still snowing pretty heavily outside and with dinner finished there wasn’t really much else to do apart from go to sleep. Nestled in my sleeping bag with all my clothes on, practically group spooning two French people, I had never imagined my evening panning out like this when I woke up that morning. Around 11pm I was awoken from my slumber with a pounding headache. It felt like one of those pylon hammering machines used on construction sites was rhythmically thumping inside my head. I didn’t want to have to get up in the middle of the night to go to the bathroom so I had purposely not drank any water before bed. That was not the best idea as I felt like I had the worst hangover I’d ever had but without all the benefits of the festivities the night before! Turning to the side looking for salvation, I was confronted with the French couple. For a split second confusion clouded my thoughts, I tried to recall how I had gotten myself into this situation, usually too much alcohol is the leading factor in waking up next to a stranger. My mind darted back and forth but the penny finally dropped. After establishing where I was, I realized that I’d left my bottle of water outside in my backpack which meant having to venture outside the warm protection of the fabric womb. Wriggling out of my cocoon, I battled for several minutes to find the zippers to freedom from the clutches of my dome captive. How many combinations of zippers can one tent have, it seemed like there were more layers than on onion! I was starting to get frustrated and felt like tearing at the walls as I balanced in a position trying not to tread on my room mate’s feet whilst trying to break into a bank vault. This is definitely not glamping! 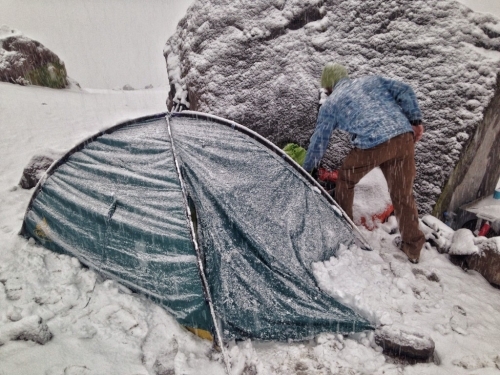 Finally cracking the combination to the tent, I gave the entrance a smack with my hand to clear the snow that had covered my escape route. It seemed overly bright for the middle of the night as trod over to my backpack to the sound of the crunching snow beneath my boots. I looked up at the sky and witnessed the most amazing full moon I had ever seen. There was not a cloud in the sky and the moon was surrounded by this huge halo the likes of which I had never seen before. I tried to capture it on my iPhone but alas, my phone photo did it no justice. If you want a visual image of what I am talking about you can read this explanation of how they are created. In a way I was kind of glad I couldn’t take a picture of it because the best memories are those that you capture with your internal camera. Over time, recollection of those memories distort the original experience and mold it into one even better than the original. Taking my bottle of semi frozen water back to bed, I took a few huge gulps of water before drifted back to sleep. I’m roused from my sleep by Marco’s voice echoing through the valley, “Chicos!!”. I’ve never had to get up at 1am before, that’s the time I usually go to sleep! It felt like a scene from the movie Inside Out where all my emotions were running around in a state of panic trying to workout what the hell was going on. Once they had all regained composure, joy was behind the wheel, ready to commence my accent. No longer than fifteen minutes into the Chachani trek and the French girl decided that she was not up for the challenge. Marco pointed in the general direction as to where she should head towards to find base camp. The French girl wasn’t happy with his inaccurate general pointing with his pole and I didn’t blame her. 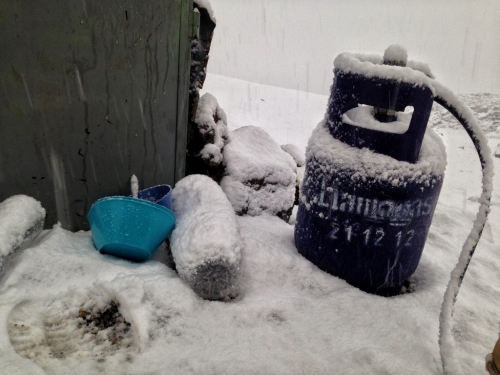 There were no distinct landmarks to orientate yourself with and our Chachani base camp was completely covered with snow. Marco yelled down the mountain to Gusto to turn on his head lamp. A few moments later and the intermittent flashing of Gusto’s headlamp emerged from the darkness. It wasn’t even coming from the direction I had assumed the camp would be! He flicked the light on and off like a Morse code message from a passing ship in the night. With this reassuring beacon, we parted ways with the French girl and continued with our Chachani ascent. I can’t feel my face when I’m with you Gusto, but I love it! We had been hiking for about four hours and I was completely drained. Furthermore, the unconventional running socks that I was wearing had slid off my feet completely. Similar to unpacking a new pair of shoes, they had been stuffed at the front of my boot like newspaper. 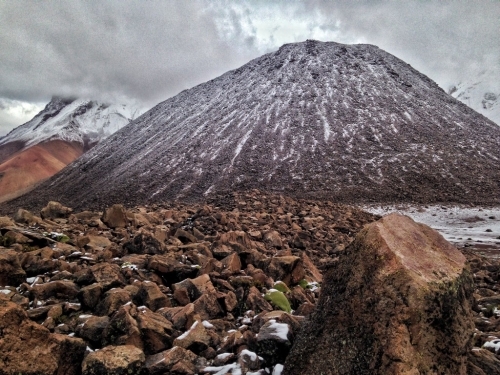 The weather conditions were not ideal and the heavy snowfall was adding to the grueling trekking conditions. I’d been walking in William and Marco’s foot steps in order to conserve energy, but even with that technique in some sections I was sinking knee deep into the snow. I had completely lost my appetite, an afternoon acclimatizing at 5000m was obviously not ample enough time for my oxygen starved body to adjust. If only I could have fueled up on gas! The fuel light in my mind had started to flash, I needed to refuel but all the petrol station Bowsers were out of commission. I was unable to replace the calories I was rapidly burning as we zigzagged up the Chachani mountain side. I force fed myself some Oreo cookies, I figured I should at least try and eat even though I wasn’t hungry but it was a struggle to swallow them. We’d been taking exponentially occurring breaks as we ascended Chachani, a technique used to combat the diminishing levels of oxygen. Marco would periodically ask us both how we were doing, I finally responded that I was feeling a little nauseous but he just seem to dismiss this. It was like he was conducting a survey but taking no note of the significance of the answer. He would jot down our responses and continue on with the next question. Slumping against my poles, Marco stated that we had reached 5700m. My exhausted body released just enough energy for my brain to do the maths, we’d only ascended 700m in 4 hours! 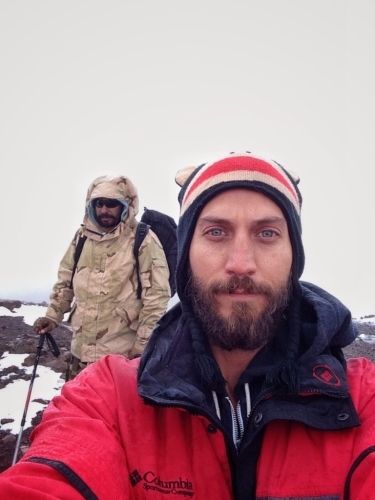 “We have about 3 more hours of climbing to get to the summit” he casually commented. William and I looked at each other, I was praying that he was feeling the same as me and didn’t want to continue. “I can’t feel my toes” announced William, “I think we should head back… It’s been a great experience but I am worried about my toes”. William had previously told me he’d had first degree frostbite and was worried about it occurring again as he was predisposed to suffering from it. I immediately endorsed William’s suggestion, we still had to descend back to back camp and I was already running on emergency power. It was going to be another hour or so to get back to base camp according to Marco, I looked down the slopes and wish I’d carried up some skis. The mountains are both beautiful and deadly! The taste of bile flooded my mouth. That impending feeling that my body was going to expel the contents of my stomach was upon me. Spitting the foul taste from my mouth I folded over in preparation for the first wave of convulsions. After two agonizing contractions my stomach had expelled the Oreos from my system. A black pool lay before me, it looked I’d been possessed and the altitude had exorcised the demons from me. Wiping the residual drool from my mouth, I continued to descend, focusing on following the path the others had carved out. Descending can be just as hard if not harder than ascending as you are constantly braking with your legs. When you’re tired this makes for the perfect conditions for rolling an ankle. I fell backwards, laying in the snow unable to get up, like a beetle flailing around on it’s back, my hiking poles mimicking bug legs sprawled out on the ground. It was so nice to lay down, I imagined that this was what it must feel like to be drowning. Initially there’s panic, but then this blanket of bliss consumes you and you feel all warm and cozy. 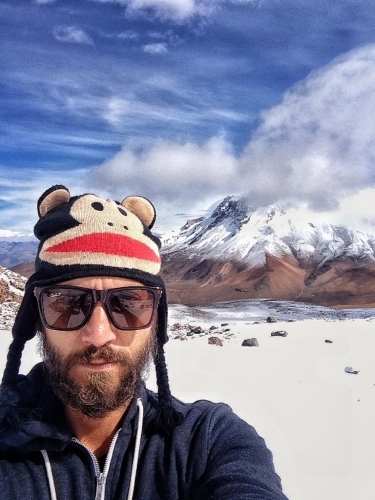 A stylish Paul Frank beanie that I borrowed from the hiking tour company. No, I must get up! I thrust my poles into the snow, they met with a rocky base providing the leverage I needed to launch myself back onto my feet. The other two hadn’t even noticed my hiatus, oblivious to my misfortune they had continued on without me. Base camp was still an hour downhill and the only thing that was keeping me going was day dreaming about the eating expedition I was going to partake in once I got back. After making it back to the Chachani base camp we had a few hours rest before breakfast. I still wasn’t hungry and I was also a little hesitant about eating after the repercussions of the last meal. It was like I had created a conditioned fear within myself, I felt like Little Albert from the Little Albert experiment who was conditioned to fear furry things by association. The sun was shining, the snow had started to melt already, the sun’s rays are so intense at altitude. You get the reflection off the snow plus the direct sunlight, a UV assault on two fronts to burn your skin. 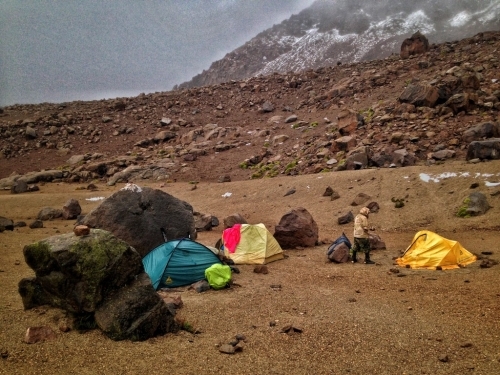 Whilst packing up all the tents, it dawned on me, I still had another hour of hiking to get back to the pick up point! I looked down at boots hoping that by some miracle I was wearing the ruby slippers worn by Dorothy in the Wizard of Oz. There would be no heel tapping to get me out of this scenario, the only way out was for me to walk out. It’s like being on the surface of Mars only there’s snow and Matt Damon had already left. Finally arriving at our pick up point after a failed attempt at Chachani, I dumped my backpack onto the ground, laying on the gravel waiting for our transportation. Marco was on the phone to driver coming to retrieve us, he hung up the phone and addressed us. “Ok… The car can’t come all the way up so we need to walk another 10 minutes to meet him”. Propping myself up I just sat there for a moment in disbelief, I was hoping he was joking but he wasn’t. I felt like I was the good guy in an action movie, thinking he’d killed the bad guy but later discovering he never actually died and that he’d returned to seek vengeance! Marco ushered us down the roadway, not only could I see the 4WD in the distance but the car alarm had been triggered. It resounding throughout the valley, it’s wailing continued as we approached the car. The driver still hadn’t turned off the alarm when we arrived at the vehicle, I assumed that he had turned it on to signal his location but that didn’t seem to be the case. 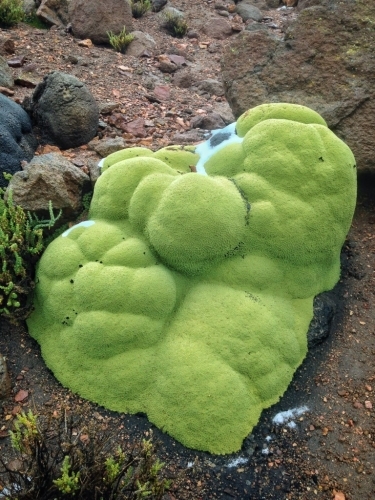 This is the only thing that resembles some form of life on the mountain. He had scaled the car roof in preparation for strapping down our luggage to the roof, the others passed up their packs but still the car alarm howled. The thing that annoyed me the most was that no one else seemed bothered by it. Then I started to think, what if there was something wrong with the alarm and we had to drive the 3 hours back with it screaming the whole time! I made a comment to the French couple about it but they didn’t seem to be bothered by it. Eventually I cracked, I could handle the irritating monotony of the alarm anymore, I frustratingly asked Marco to turn the alarm off. He grabbed the keys off the driver and pushed the button, the alarm stopped. Ah the sweet sound of… it started wailing again! Marco fumbled with the keys, pushing the buttons more vigorously this time and waving the remote in the air. It was like he was desperately trying to silence a crying child, sternly talking to them but also partly thinking it was futile. Finally his attempts paid off! With the alarm silenced we all jumped into the 4WD, luggage secured on top and a windy, bumpy, muddy road in front of us. What other obstacles were we going to encounter on the way back? I closed my eyes and drifted off to sleep, “Hasta la vista Chachani, I’ll be back!”. I had not heard of this mountain! Adding it to the list 😉 Thanks for sharing your adventures. You are an excellent writer, you have a vigorous narrative and description. Really your chronicle is more illustrative of your experience than a photograph. Thank you. I congratulate you. I don’t remember how much it cost as I did it over 3 years ago. Whatever it costs it definitely worth the experience!